Director Konrad Buhagiar gave a lecture at the beginning of February at the College of Arts and Science of the University of New York. The subject of the talk was about the heritage of Valletta, and how it is derived from an identity forged in response to specific climate conditions. In fact, the restless search to achieve sustainable comfort during the centuries has irrevocably influenced Valletta’s unique heritage and identity. These three key words leading the lecture generated a discussion on how modern interventions and technologies can take old buildings into a new time and a new life. 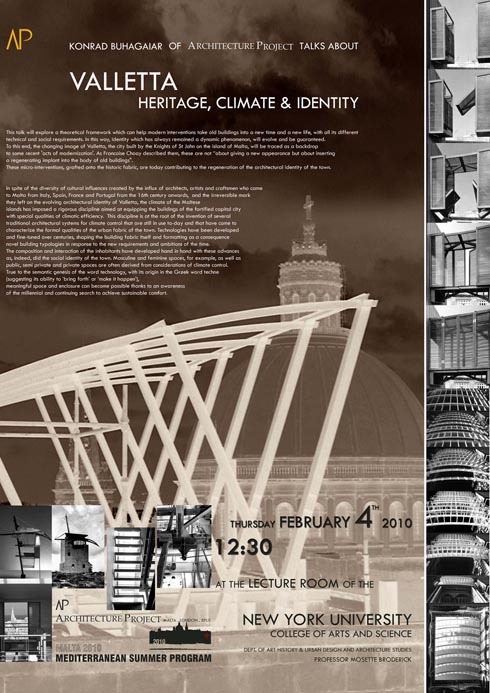 Konrad explained to the American audience how foreign artists and architects have left their irreversible marks on Valletta’s appearance from the 16th century onwards, and how the Island’s climate, which they had to contend with, forced them to develop rigorous disciplines of climatic efficiency. Some of those architectural systems are still in use nowadays and characterize both the capital’s urban design and the social identity of the town along with new building typologies that have been built over the most recent years.